PROBEERSEL.COM - Welcome to probeersel ! PROBEERSEL.COM is your site on the web for quality graphic novels, comics and artworks by new and struggling artists. It features their work, background information to the artists and their work, and other things of related interest. Everything is absolutely free to read ! This site originally was the home site of all of René van Densen's comics, and his graphic novel quintology "Probeersel". It was redesigned early in 2002 to make it more suitable for other artists to publish their work on as well. This site always welcomes new artists who would like to see their work published here. Their rights and copyrights will at all times be respected. Publishing your work on this site is absolutely free of charge but the webmaster reserves the right to refuse content when deemed unfit to the site. The webmaster hopes you will enjoy the comics that are up here, and check back for new material and updates ! Okay. So for the first time in some six(!) years, we have some news. 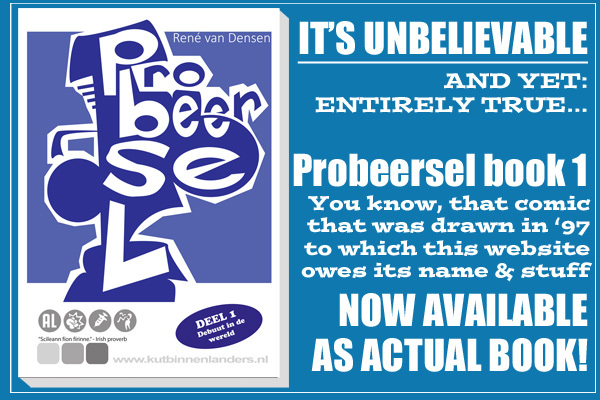 The Probeersel books are appearing in, well.. Book form. In Dutch only, and it's an extremely limited run. To learn more (in Dutch), check out this brand new website that's all about our very own René van Densen. Book 1 came out two days ago, books 2 - 5 are also in preparation. To note: These books were written and drawn almost two decades ago and are still amongs the most popular comics on this site! SO WHAT'S SO SPECIAL ABOUT TODAY ?